In March of 2015, two Union members hailing from Takatsuki’s sister city of Toowoomba, Australia, who had, on account of their union activity, been forbidden to attend graduation ceremonies at the elementary schools where they had been teaching English for one year, entrusted the Union with their letters for the mayor of Takatsuki City (Letter 1, Letter 2). These letters were handed by the General Union to a representative of Takatsuki City. Now a letter from the mayor has been handed to us. But there has been no statement of apology to either the two members who were victims of the unfair labor practice, or to the General Union, which was subjected by City officials to baseless slander from the podium in a City Council meeting. So the so-called “Takatsuki AET Graduation Ceremony Incident” has come to a conclusion. But most of the problems relating to this case remain unsolved. Takatsuki City is also suing Osaka Prefecture in a separate case, which is still pending in court. Furthermore, Takatsuki City did not provide legally appropriate conditions, based on an employment relationship, to the teachers they had been inviting for twenty years from Toowoomba, Australia, to work as Assistant English Teachers in their city elementary schools. They did not allow them any paid holidays or enrollment in insurance, but left them in a state of having no legal rights. After a complaint from the teachers themselves, the Osaka Labor Commission granted recognition on June 28, 2016, that there was indeed an employment relationship between them and Takatsuki City. Takatsuki City filed no legal objection to this, so it became final. Yet even now, more than two years after this famous scene of illegal treatment, Takatsuki City has left the problem as is, showing no sign of caring about the harm done. There is still more. When the incident happened in 2014, Takatsuki City, fearing that the scandalous relationship between the City’s leadership and a group of former City officials would be found out if the AETs and the union brought it to light, suddenly declared the Toowoomba AET program itself to be “suspended for one year”. Then, even after one year had passed, they kept delaying the “discussions on restarting” it, claiming that “the case is still pending” as their excuse. 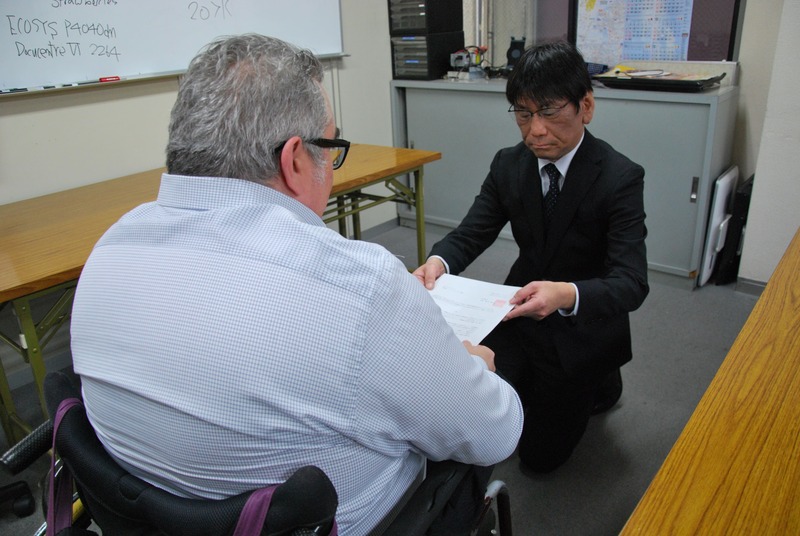 However, not that the mayor of Takatsuki has delivered us his “Written Oath to Prevent Recurrence of Unfair Labor Practices”, even this excuse is gone. Takatsuki now has no more reason not to hold “discussions on restarting” the program. They cannot escape their problems. Takatsuki City must face the problems they themselves have caused, and start on a path toward good-faith solutions. There is no prospect for them in doing anything else.